Not all blog owners, who publish blogs outside the BlogSpot address space, have any feeling for the complexity of the DNS infrastructure. We see the questions periodically in Blogger Help Forum: Something Is Broken. when I try to publish the blog to the domain. Why some - but not all? The DNS infrastructure is undefinably complicated. DNS servers are used in many places, equally essential. Let's look at the cast of characters involved, in providing addresses for your domain. The DNS servers provided by your DNS host / registrar contain the master copy of the DNS addresses. The DNS servers provided by your ISP (when you use ISP based DNS) provide the addresses that let you use local utilities, and access your blog, from your computer. 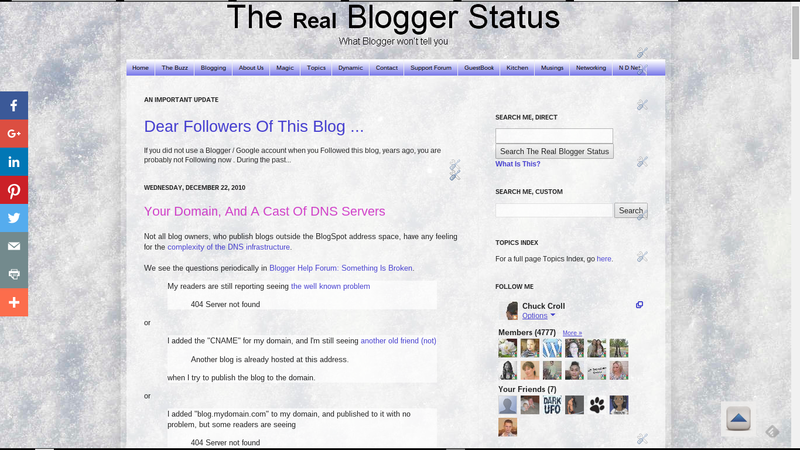 The DNS servers used by Blogger / Google servers provide the addresses that let you publish your blog to your non BlogSpot URL. The DNS servers provided by your readers ISPs provide the addresses that let your readers access your blog, once it's published to your non BlogSpot URL. The DNS servers accessed by the various Internet based utilities provide the addresses that let you diagnose some custom domain publishing problems. Various DNS servers are maintained by different owners. All of these servers are updated on different schedules, somewhat (but never consistently) predictable, based upon DNS Latency figures. Some servers are generally up to date, immediately after you make an address change. None of these servers are controlled by Blogger / Google, causing an intriguing role shift by the Google "servers". The DNS master servers provided by your DNS host / registrar are updated immediately, or almost immediately (depending upon geographic dispersion). The DNS servers accessed by some Internet based utilities, such as the Who.Is display, may report details straight from the DNS master servers for your domain. Some servers do not update, immediately, when changes are made. Some servers are not generally up to date, immediately after you make an address change. The DNS servers provided by your ISP (when you use ISP based DNS) provide the addresses that let you use local utilities, from your computer. These servers update, irregularly, from the DNS master servers. Here's where many blog owners, outside the USA, see the problems. Note that some domains actually are registered outside the USA too - and the problems may be reversed. I know I entered that address correctly, I just can't confirm it! The DNS servers used by the Blogger / Google servers provide the addresses that let you publish your blog to your non BlogSpot URL. These servers update, irregularly, from the DNS master servers. Here's where Blogger sees a problem. I know I entered that address correctly, but Blogger won't let me publish it! The DNS servers provided by your readers ISPs provide the addresses that let your readers access your blog, now published to your non BlogSpot URL. These servers update, irregularly, from the DNS master servers. Here's where you see the variations, when your readers are scattered all over the world. I know I entered that address correctly, but some why, just some?? of my readers still can't see my blog! The DNS servers accessed by various other Internet based utilities, may report diagnostic details from their local servers. These servers update, irregularly, from the DNS master servers. I know I entered that address correctly, I just can't confirm it online! Addressing differences, between different servers, cause different problems. The involvement of the latter group cause an intriguing variety of symptoms, which result in many interesting problem reports in the forums. And if the domain is not setup properly, can cause a long term variety of secondary symptoms. If you purchased the domain using "Buy a domain" (now "Google Domains"), the above issues should be somewhat less of a problem, because of the Transition time period, that should be applied by Blogger. If you setup the domain yourself, after purchasing from a registrar - as is the case for every domain purchased after 2012 - you need to maintain a Transition period, yourself - or expect problems, during the first week or so. Mistakes by domain owners, multiplied by address difference, create challenges. Besides all of these details, we have to realise that the DNS settings are controlled by blog owners. Few owners have any concept of the intricacies of DNS services - and many have to now learn to setup their domains. Considering all of these details, it may be a miracle that many custom domain published blogs work, at all. Publishing a Blogger blog is a very simple activity - or can be, with the right decisions made. This can be true, for publishing a Blogger blog to a custom domain. With custom domains, one should consider the consequences of mistakes - which the owner may not see, even with some readers seeing problems.